MORGANTOWN, W.Va. – WVU Football Coach Dana Holgorsen, former WVU and NFL quarterback Jeff Hostetler, and West Virginia native Steve Antoline have been named co-chairs of the $60 million capital campaign to build a new home for WVU Medicine Children’s pediatric and maternal services. The 2018 season will mark Holgorsen’s eighth at the helm of the WVU Football team. A native of Iowa, he is currently fourth on the school’s all-time win list, and he has led the Mountaineers to bowl games in five of the past six years, including three straight. West Virginia has been ranked in both major polls at least one week in six of his seven years. He passed the 50-win mark during the 2017 season. 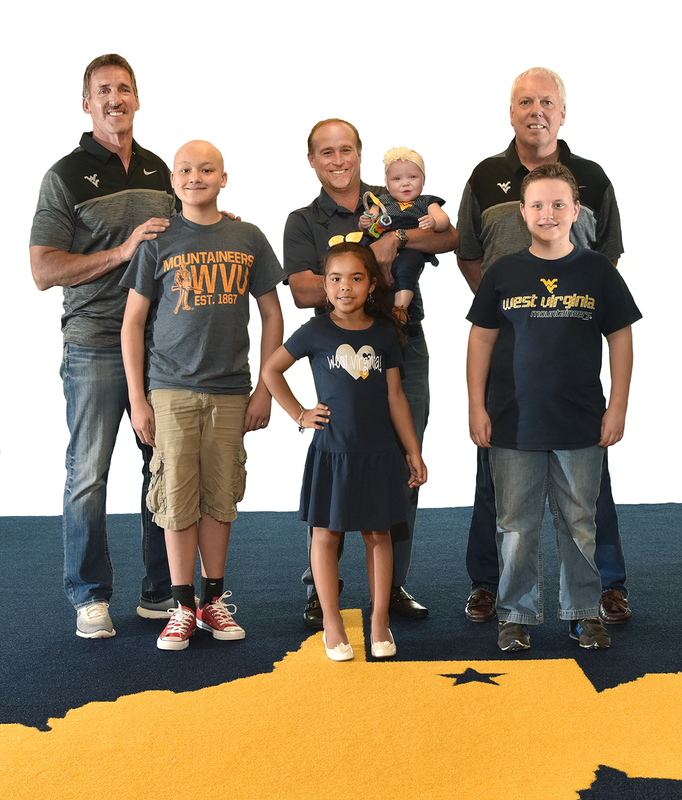 Through his position with WVU and the longstanding relationship between WVU Athletics and WVU Medicine Children’s, Holgorsen has become a champion and spokesperson for WVU Medicine Children’s, appearing at events and in commercials raising funds and awareness. Last month, the inaugural “Walk the Talk with Dana” event was held to raise money for WVU Medicine Children’s. A native of Pennsylvania, Hostetler had an 18-6 record as a two-year starter for Coach Don Nehlen’s Mountaineers and captained the 1983 WVU Football team. He was chosen by the New York Giants in the third round of the 1984 NFL draft and won two Super Bowls with the Giants. His 15-year NFL career included stops with the Giants, Los Angeles/Oakland Raiders, and the Washington Redskins. Hostetler and his wife Vicky have been passionate about providing assistance to children and families facing hardships due to traumatic injury, illness, or financial crisis. Over the years, they have used their focus of family and faith to guide not only their lives but the community activities they support. As the parents of three sons – who, at various stages in their lives, have needed the care of WVU Medicine Children’s – the Hostetlers understand firsthand what families and, more importantly, children go through during their stay at the hospital. This led them to become members of the WVU Medicine Children’s Leadership Council, where they could advise and promote community involvement. Involvement with the Leadership Council and their children’s experiences led the family to donate $750,000 to WVU Medicine Children’s for the creation of the Jeff and Vicky Hostetler Family Resource Center, which provides patients and their families with information about health conditions, area lodging, and community support. Antoline, from Mount Lookout, W.Va., is a WVU alum and member of the WVU Medicine Children’s Leadership Council. After receiving his Regents Bachelor of Arts degree from WVU, he founded Superior Highwall Miners, Inc., a Beckley-based company that grew into the world’s largest manufacturer of highwall mining equipment. Antoline continues to operate various businesses throughout the state and serves as a trustee on the West Virginia State Investment Management Board. He and his wife, Jamie, have been generous supporters of WVU Medicine Children’s and the University for many years. Their donations have helped to fund scholarships, programs, research, and facilities in several areas of the University, including Athletics, the WVU Cancer Institute, and WVU Extension. In recognition of their generosity, the football practice field at WVU is named the Steve Antoline Family Football Practice Facility. Also, in 2013, WVU Extension honored the Antolines with its Outstanding Philanthropists Award. Both are members of the WVU Foundation’s Woodburn Circle and Irvin Stewart donor recognition societies. The campaign officially launched in November, when the plans to build the $153 million tower for WVU Medicine Children’s were announced. Upon its completion in late 2020, the tower will add 155 beds to WVU Medicine J.W. Ruby Memorial Hospital. It will result in expanded intensive care and obstetrical units; dedicated operating rooms and heart catheterization and endoscopy suites; and outpatient clinics. For more information on the campaign to build a new home for WVU Medicine Children’s, including ways to support the fundraising efforts, visit wvumedicine.org/growchildrens.